(UPM, Helsinki, 5 December 2016 at 09:00 EET) - UPM is one of the eight companies that have been recognised by the CDP Forest Program with a global leadership position in the 2016 Forest A List for timber and timber based products. The A List features companies that are on a path to sustainably source or produce timber commodities. "UPM is committed to forest management and forest harvesting practices based on the internationally accepted principles of sustainable forest management", says Sami Lundgren, Vice President, Environment and Responsibility. "Our objective is to create long-term profitable business in an ethical and responsible manner, taking into account economic, human and social, as well as environmental matters. We consider forest certification to be an excellent tool for promoting sustainable forestry. Today 84% of the wood we use is certified and our target is to grow the percentage up to 100% by the year 2030," says Lundgren. "The business case for breaking the link between deforestation and the production of forest-risk commodities has never been stronger. 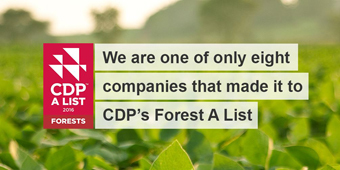 We congratulate those businesses that have achieved a position in CDP's Forest A List for timber. These companies are responding to market demand for environmental accountability and at the same time are making progress towards achieving deforestation-free supply chains. This will not only protect forests, but will help influence market behaviour towards a more sustainable economy," says Katie McCoy, head of forests at CDP. UPM has always taken care of the vitality and regeneration of forests. Furthermore, the company has had for over two decades its own biodiversity programme, which is fully integrated into company's forest management practices. Specific species projects and case studies in the programme develop forestry methods to meet the needs of single species and creates a new working culture in collaboration with stakeholders. UPM also promotes voluntary-based nature conservation, and protected areas are part of the biodiversity programme solutions. "We are pleased that also our efforts on enhancing biodiversity have just recently received recognition. FIBS, the leading non-profit corporate responsibility network in Finland, awarded us for biodiversity reporting in the company's annual report 2015 and on the related webpages," concludes Sami Lundgren. Read more on upmbiofore.com. The CDP's report examines what steps companies are taking to protect their supply chains and bottom-lines against deforestation-related risks. It has been produced at the request of 365 investors with US$22 trillion in assets by CDP, who request data from large corporations on their efforts to mitigate deforestation risks. Link to report: Revenue at risk: Why addressing deforestation is critical to business success. CDP, formerly Carbon Disclosure Project, is an international, not-for-profit organization providing the global system for companies, cities, states and regions to measure, disclose, manage and share vital information on their environmental performance. CDP, voted number one climate research provider by investors, works with 827 institutional investors with assets of US$100 trillion and 89 purchasing organizations with a combined annual spend of over US$2.7 trillion, to motivate companies to disclose their impacts on the environment and natural resources and take action to reduce them. CDPis a founding member of the We Mean Business coalition. Please visit www.cdp.net/ or follow us @CDP to find out more.